Zipper leather boots, no matter what time of year, look hot. Ankle boots - These are also called booties and there are plenty of leather styles of these boots around that feature a zipper. Calf height- Think of the height of the shaft of these boots, the same height as a typical pair of UGGS. Motorcycle boots - You don't have to own or ride a motorcycle to rock out a pair of this style of boot. Zipper construction - You want to try to choose boot with a gusseted zipper. A gusset is an extra piece of material around the zipper to make it stronger. Zippers take a lot of beating, especially on boots. Stitching - Whether you are shopping online or in a store, always make sure you take a look at the stitching. You want to make sure that it is with quality thread (it should be relatively thick) and that the stitches lock together. No heel - If you choose no heel boots, make a note of the sole's thickness. You don't want a heel so thin that you feel every stick and stone underneath your feet when you are walking outside. Stacked heel - Boot manufacturers make stacked heels out of stacked pieces of wood. Many times, less expensive boots have the look of a stacked heel, but are really plastic. Plastic heels, while cheaper, don't last as long as the real wood heels. Stiletto heel - The only thing you want to think about when purchasing stiletto heeled boots is the height of the heel. How high you go is completely up to you. Leather Up - This store features men's and women's motorcycle gear, and they have plenty of styles of both brown and black leather zipper boots. Sheplers - Features men's ankle zipper leather boots, in case you were thinking about a gift for the man in your life. 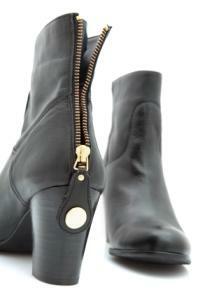 Avenue - This website focuses on tall leather boots with inside zippers for plus sizes. They also have suede boots as well. DSW - If you are looking for a cute pair of zipper leather boots, check out DSW for some of the best prices on shoes on the Internet. Shoe Mall - You have to do just a little bit of digging to find leather boots with zippers, but with so many great deals and big markdowns on these boots, the search is worth it. Leather boots with a zipper on the side or on the back are a basic (and classic) piece of any woman's wardrobe. Think about adding at least one brown pair and one black pair to your shoe collection, simply because these type of boots are so versatile and can be worn with just about any outfit.